Climb Mont Blanc - the highest peak in the Alps and in Western Europe. Its first ascent was made on August 8th, 1786 and is considered to mark the beginning of modern alpinism. The "Gouter Route" is considered to be the "normal route" for climbing Mont Blanc. From technical point of view this is the least difficult route to the top, however it shouldn’t be underestimated. Reaching the Gouter hut isn’t only walking on a tourist path, the way leads through iced ground and you should also overcome the problems coming with the high altitude. "The top of Europe" offers a beautiful climbing, even by the normal route and is a remarkable experience in itself. Mont Blanc is the highest peak in the Alps and in Western Europe. It is situated between the valley of Aosta in Italy and Haute-Savoie in France. The French-Italian border crosses its highest point. The first ascent was made on August 8th in year 1786 by Jacques Balmat and doctor Michel Paccard. Today this ascent is considered to mark the beginning of modern mountaineering. The first woman to reach the top is Marie Paradis in year 1808. Recently average 20 000 alpinists and tourists climb the top each year; however this doesn’t mean that the top is easy to reach. In August, when it is high season, the local mountain rescue service makes at about 12 flights per weekend. The combination of high altitude, relatively unstable weather, steep and exposed terrain, glacial features, orienting difficulty can be quite serious. - "Only" 990m of height gain on the third day, from the Gouter hut to the summit. This is the shortest summit day for any of the classic routes on Mont Blanc. - The difficulties increase with height, with the Bosses Ridge providing the most difficult climbing. - Technically, it is the easiest route. - The Bosses Ridge is very aesthetic. - It is the route by which the greatest number of people reaches the summit. The group is maximum 6 people. - Lift tickets (cable-car & train). Arrival and accommodation in Chamonix. Meeting with your guide in the evening, equipment check and briefing. By taking one of the first lifts and trams of the day from Les Houches to the Nid d`Aigle we will be able to climb up to the Tete Rousse hut in the cool of the morning and stop off for lunch. We will arrive at the Gouter hut in the early afternoon. Leaving the Gouter hut at around 2 a.m. we will have the whole day ahead of us to climb to the summit and be back down early enough to catch a tram and lift down to the valley. The additional day to this program is planned in case of a bad weather or if we need to stay one more night in hut on our way down from the top. 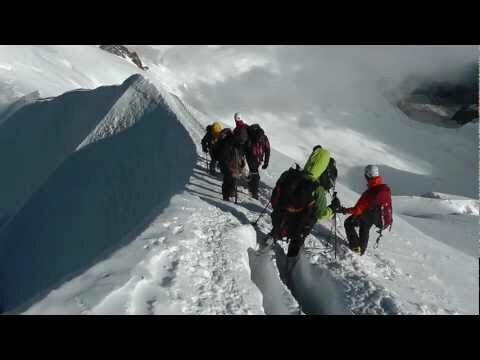 To accomplish the climb you need to be in excellent physical condition and to have previous mountaineering experience including few long outings, self-arrest technique and use of an ice-axе and crampons. - Optional: a lightweight sheet sleeping bag for the night in the hut. 4.68 / 5 stars from 75 users.